Some things in life start badly and just never improve. I have a grey silk shirt I love, but every time I wear it I manage to spill, splash or smear food on it. When I applied for a new passport at the end of last year, something went wrong at every step. My workplace has a performance pay system that (in my view) is based on flawed principles, so that every application of it leads to distress. The Jane Austen shrug has been my knitting example of this continuous decline rule (it's the opposite of the continuous improvement much beloved of management advisers). I first knitted the shrug to accompany the Jane Austen dress as a Christmas present for the dotee. Both are from Kay Gardiner and Ann Shayne's Mason-Dixon Knitting Outside the Lines. The dress was a great success. The shrug was very much too small. My fault - I'd used a thinner yarn than the one recommended, but thought hopefully that it would fit as the dotee is small for her age. It didn't. I had enough yarn, so I knitted it again. Now I think of it, probably the first error was that I miscalculated the amount of yarn I needed for the shrug and have enough to make the shrug at least four times over. This second time, the shrug's significantly too large. 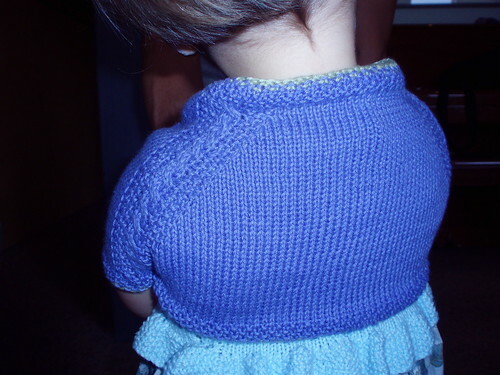 I can't now remember why I decided to make the 6 year size (when the dotee is a small not-quite-two year old). Clearly, a stupid decision. I'm sure this photo is an indication of how possible it is to make garments look good in photographs - though you can see the shrug gaping around the back neckline. The main problem is that it gives a new meaning to the term shrug - in this case, the smallest shrug of the dotee's shoulders has the garment hanging from her wrists. I think I hadn't quite grasped that shrugs need to be snug to keep them in place. Maybe they should be called snugs to give clues to stupid knitters like me. I have no intention of knitting the shrug yet again. I've so far omitted from my litany of disasters with this project all the problems with wrong-sized needles; with slippery metal needles and slippery cotton yarn; with errors in counting for the cabled panels; with cables cabling in the wrong direction and so on and so on. For a tiny project it had a multitude of problems. Anyway, the dotee is growing and the accompanying dress won't fit her much longer. This is it. So, I'm going to try a kind of i-cord loop attached to buttons on each side to prevent the shrug descending from her shoulders. I'll keep you posted. The second delivery from my 2009 Personal Sock Club arrived today via its manilla envelope package. We had some discussion at the Morris and Sons knitting group about whether or not the Personal Sock Club allowed you to commence another sock before the scheduled 'delivery date'. 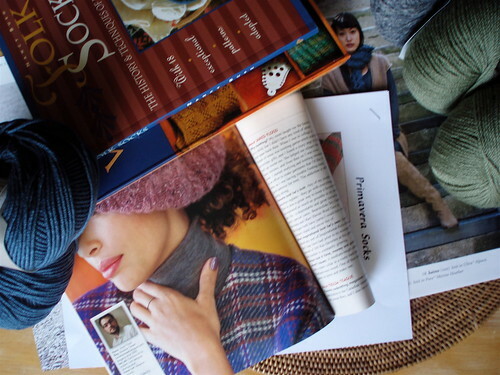 I'm being purist about this (let's avoid the word 'obsessive') and have decided that just as you receive deliveries in a real sock club on a scheduled date, so I should not see my next yarn or begin my next project before the dates I've plotted. My second Sock Club project is The Knittery Merino Slim Sock in Bloody Mary, which is a beautiful deep red-burgundy fine yarn that I think will have great stitch definition. I've decided I don't want to make anything lacy, even though other knitters have used this yarn for lace with great success. 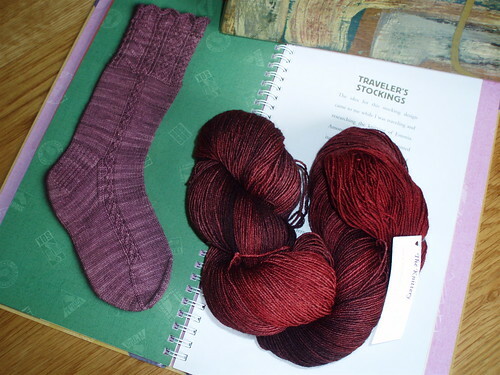 So I've continued with my Nancy Bush passion and, having just acquired 'Knitting on the Road' have decided to make the Traveler's Stockings. Once I begin, I might change direction, but this is the plan so far. Last night I went to hear Gidon Kremer and the Kremerata Baltica play in the Concert Hall of the Sydney Opera House. Very occasionally across my life I've had the sense that I'm experiencing a truly great performance. Not just a very good performance, or an enjoyable performance, but one that reaches a level of absolute excellence. Last night was like that. When Gidon Kremer won Moscow’s highly coveted International Tchaikovsky Competition in 1970, conductor Herbert von Karajan dubbed him ‘the greatest violinist in the world’. Audiences around the world still concur with this illustrious assessment for Kremer’s sustained excellence across an unprecedented range of styles and forms. The program was very eclectic, ranging from Beethoven and Mendelssohn (a concerto composed when he was 13! ), through to contemporary composers such as local Carl Vine, US jazz great Chick Corea, and one of my favourites, Argentinian Astor Piazzolla. If you're in Sydney and looking for something wonderful to do tonight (17 February), there's another performance in the Opera House - this time with mainly Baltic composers, Carl Vine and Mozart. Again, I've rather belatedly discovered a fad. I saw a couple of references to Jane Brocket's blog, followed them up, and was delighted. 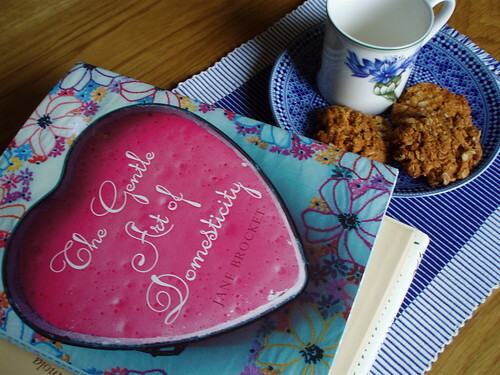 Then, when I had the opportunity to purchase a copy of the book that largely derived from the blog, The Gentle Art of Domesticity, I did so. I've found the same pleasure in reading this book that I find in browsing through copies of decorating magazines - in particular, my decorating magazine of choice, World of Interiors. I don't think I confuse the worlds depicted by such magazines, books and blogs with my everyday world. My world is not one where taste is certain, order is absolute (or disorder is charming), flower arrangements are profuse, inspiration lies in the everyday, everything is clean, and there is no sense of chaos or hurry. But I love the escapism of looking at images of such a life, and I think they do cultivate what Jane Brocket calls 'a habit of seeing'. There are tastes I share with Jane Brocket, judging by her book and blog. I have always liked paintings of domestic interiors and still lifes of domestic objects. I like the way she returns to a squared geometry in presenting the objects in her photos. I love the riot of colour in her blog and book. (Initially I thought I loved the colours even though my tastes were quite different, and then I reminded myself that my spare room is painted Schiaparelli pink with turquoise window trims - a less tasteful version of the colours on the cover of The Gentle Art of Domesticity). I also enjoy what in my childhood was called 'handwork' - and across my life have knitted, woven, patchworked, made decoupage and am now knitting again. And I cook and bake. There are also differences of taste. I've spent most of my adult life avoiding gardening, though I enjoy the products of others' labour. I hate gaudy lollies. I find fairy cakes a bit boring. And there's an Englishness about Jane Brocket's depiction of her life that raises the hackles of my colonial spirit. I recognise this last comment is totally unjustified as a critique of the book - what else could it be but English? I think what I'm actually reacting to is what I perceive as complacency about the book's englishness. (I hope I'm not about to lose my English friends!). But, I've enjoyed the book and have allowed myself to escape into the world it creates. You might think that everything that needs to be said about this blog and book has already been said - in which case you can skip the next paragraphs. But I've been interested to work through my own attitudes. I do wish that Jane Brocket hadn't written the rather defensive introduction in praise of domesticity. I think she creates a false dichotomy between 1970s feminism and the freedom women might feel to practice domestic crafts (a term I prefer to 'arts'). Like many people looking back on feminism, she neglects to realise that feminism was and is not a monolithic set of beliefs, but rather a diverse set of theories and practices that individual women and groups of women adopted, discarded, and re-adapted in trying to make a freer and more meaningful life for themselves. Personally, I never had difficulty in calling myself a feminist, while cooking, weaving and making slip-covers for my chairs. But I'm immensely glad that I had the opportunity to acquire an education that enabled me to work if I chose to do so in fulfilling jobs, and earn an income. My mother spent her life cooking, sewing, cleaning, and being a carer for others. Most of the time these were not her choices, and while she was extremely competent at these tasks, I doubt they brought her much pleasure. I've been able to choose to knit, sew or bake and to sub-contract to others those domestic tasks I find uninteresting or displeasing. The pleasure I take in domestic tasks is possible because I have choices - choices that are available because of my class, the country I live in, the education I received, the time into which I was born, and the achievements of second-wave feminism. I'll continue to read Jane Brocket's blog with pleasure, and use her book as another 'way to see'. And I'll continue to recognise my life has been possible because of the achievements of feminism and because I'm very fortunate. I'm counting my blessings for a second time this week..
On Tuesday this week I woke at 4.00am with chest pains. Not acute - more like pressure or tightness in my chest. It recurred intermittently across the day, and persisted until Wednesday morning. By lunchtime Wednesday, with all the warnings about consulting your doctor if you experience chest pains ringing in my ears, I visited my GP and described my symptoms. Somewhat to my astonishment, she quickly dispatched me to the emergency service of my local hospital with a letter requesting tests of my heart's functioning. Over the next three and a half hours I was given an ECG, had my blood taken and tested, and described my symptoms in detail to two different, sympathetic, non-condescending doctors. At the end of this time I was discharged, having learned that I have a perfectly healthy heart - indeed, a very healthily relatively slow-beating heart. Of course I was relieved that there was nothing wrong with my heart. My GP and I are now monitoring for more mundane and less anxiety producing digestive causes of the pain. But I've reflected many times over the last couple of days on just how fortunate I am to live in a society that, despite the inadequacies of healthcare funding, can respond so quickly and thoroughly to the possibility of serious illness, and do so without charging me a cent (other than the taxes I've paid over many years). Of course, I realise that I'm more fortunate than many because I live in the inner city where my 'local' hospital provides a full range of world-class services, all day, every day. I know many people in outer suburbs or country areas do not have access to such services. I'm also fortunate I have a GP who has treated me for many years, listens to me, and takes symptoms very seriously. It's very easy to count my blessings just now. 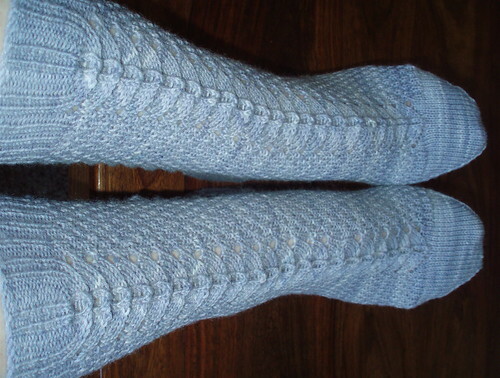 The socks that are the first installment of my 2009 Personal Sock Club are finished. 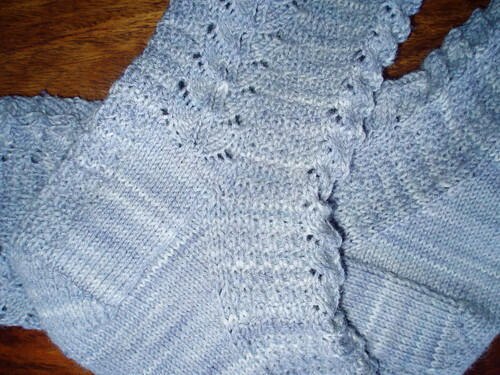 They are Nancy Bush's Child's French Sock, re-sized for a woman, in grey Araucania Ranco. It's one of the designs from 'Knitting Vintage Socks' in which Nancy Bush adapts patterns from the nineteenth century 'Weldon's Practical Needlework' series for more modern yarns and times. I'm very pleased with my socks. I like the combination of the lacy panels, which the original pattern apparently called Citron Pattern, and the busy, dense regularity of the background - originally called, somewhat mysteriously, Diaper Knitting. I have no idea when or how I'll wear them, but I like them so much that I've found myself plotting a shoe purchase to show them off. I also liked the pattern. I'm not a particularly experienced sock knitter, and I've not yet developed strong preferences for particular techniques. So, Nancy Bush's quite detailed instructions, which I followed assiduously, not only resulted in socks I like, but also reassured and comforted me along the way. 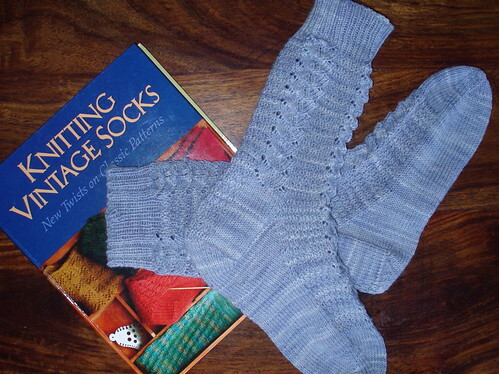 The next 'delivery' from my Personal Sock Club is due on 21 February. This rather odd date is the result of my finding a seventh skein of rather boring grey patonyl yarn I'd missed in my original accounting and then re-plotting my year's schedule to have new sock yarn every 52 days. This is beginning to sound very obsessive! I'm quite envious of MissFee, RoseRed and JP who have wonderful and exotic yarns to spice up their personal sock club. I think I've missed part of the point of this activity, in that most people view it as a substitute for receiving some wonderful and surprising (but expensive) yarn from a sock club. I think my activity is more like just knitting up rather ordinary yarn I already have - a much more boring activity. Anyway, I'm ahead of schedule and - rather surprisingly - looking forward to the 21 February lucky dip. I've never been very good at making lists, working through the items and ticking them off. Though now I think about it, that's a generalisation that's not universally true. I make and rigorously use lists for specific, immediate purposes. I use shopping lists and dinner party lists, and I always make travel lists - enumerating the things I need to pack and the things I need to do before leaving. But I don't make and use the big, sophisticated kinds of lists much valued by time management experts that set deadlines, and allocate priorities and timelines. Every time I've tried to do this I become panic-stricken and realise that I either can't do everything that should be done or don't want the kind of life that's represented by the list. So I revert to muddling along through allowing the most urgent (or sometimes the most pleasant) tasks to rise to the top of my non-list of things to do. But, going against all my previous experience and habits, I've made a list of my projected knitting for the year. I had some time off work today, and I've used the queuing function in Ravelry to make my (very public) list. Partly this has been prompted by my 2009 Personal Sock Club commitment and a realisation that to get any knitting other than my socks done, I need to be a bit organised and have some idea of priorities. After much consideration and editing, I've ended up with a list of 16 projects. I almost retreated into my usual panic-stricken list avoidance at the thought of such a program, but once I counted up my completed projects for 2008 and discovered there were 23 of them (amazing! ), I've gathered courage and I'm allowing my queue to stand. I've even included a couple of wips in the queue to ensure they are completed. Here goes!